Introduction Current evidence on epidemiology and outcomes of invasively mechanically ventilated intensive care unit (ICU) patients is predominantly gathered in resource-rich settings. Patient casemix and patterns of critical illnesses, and probably also ventilation practices are likely to be different in resource-limited settings. We aim to investigate the epidemiological characteristics, ventilation practices and clinical outcomes of patients receiving mechanical ventilation in ICUs in Asia. Methods and analysis PRoVENT-iMIC (study of PRactice of VENTilation in Middle-Income Countries) is an international multicentre observational study to be undertaken in approximately 60 ICUs in 11 Asian countries. Consecutive patients aged 18 years or older who are receiving invasive ventilation in participating ICUs during a predefined 28-day period are to be enrolled, with a daily follow-up of 7 days. The primary outcome is ventilatory management (including tidal volume expressed as mL/kg predicted body weight and positive end-expiratory pressure expressed as cm H2O) during the first 3 days of mechanical ventilation—compared between patients at no risk for acute respiratory distress syndrome (ARDS), patients at risk for ARDS and in patients with ARDS (in case the diagnosis of ARDS can be made on admission). Secondary outcomes include occurrence of pulmonary complications and all-cause ICU mortality. Ethics and dissemination PRoVENT-iMIC will be the first international study that prospectively assesses ventilation practices, outcomes and epidemiology of invasively ventilated patients in ICUs in Asia. The results of this large study, to be disseminated through conference presentations and publications in international peer-reviewed journals, are of ultimate importance when designing trials of invasive ventilation in resource-limited ICUs. Access to source data will be made available through national or international anonymised datasets on request and after agreement of the PRoVENT-iMIC steering committee. Trial registration number NCT03188770; Pre-results. PRactice of VENTilation in Middle-Income Countries is an international multicentre observational study with a wide representation of Asian countries, allowing inferences on epidemiology, management and outcomes of mechanical ventilation across the entire subcontinent. The attention on ventilation practice will provide robust data on this specific domain while the 7 days follow-up will allow precise recording of pulmonary complications at their origin. The study will have a sample size large enough to obtain precise estimates of pulmonary complications and intensive care unit mortality and to examine potential associations between ventilation practice and these outcomes. One limitation is the potential constraint of laboratory data, generating a limited dataset not comprising daily severity scores useful for statistical controlling purposes. The conceivable limitation in blood gas analysis and imaging examinations may limit the documentation of insurgence or worsening of acute respiratory distress syndrome and other pulmonary complications. To gain a better insight into the ventilation practice, outcomes and epidemiological characteristics of ICU patients receiving invasive ventilation in resource-limited settings, we plan to perform the PRoVENT-iMIC (‘Practice of VENTilation in Middle-Income Countries study’), a prospective observational cohort study in ICUs in Asia. We also aim to describe the association between certain ventilator settings and patient-centred outcomes. We hypothesise that practice of ventilation is highly variable, in particular with respect to VT and PEEP settings. This understanding is fundamental to planning any intervention study in these countries in the future. PRoVENT-iMIC is an international multicentre observational study in consecutive ICU patients receiving invasive mechanical ventilation during a 28-day period, expected to run in approximately 60 centres in the following Asian countries: Thailand, Vietnam, Myanmar, Pakistan, Nepal, Bangladesh, Malaysia, Sri Lanka, Maldives, Iran and India. These countries belong to the low-income or middle-income economies, as classified by the World Bank.22 PRoVENT-iMIC is conducted in accordance with the Declaration of Helsinki and is registered at www.clinicaltrials.gov (trial identification number NCT 03188770). Figure 1 shows the study flow chart. Flow chart of inclusion of PRoVENT-iMIC. ARDS, acute respiratory distress syndrome; ICU, intensive care unit; LIPS, Lung Injury Prediction Score; MV, mechanical ventilation; PRoVENT-iMIC, PRactice of VENTilation in Middle-Income Countries. Consecutive patients intubated for ventilation during a predefined period of 28 days are enrolled. Inclusion is not restricted to patients who are intubated in the ICU, as also patients who started invasive ventilation in the emergency room, normal ward, community or operating room directly preceding the present ICU admission are eligible for participation, without any minimum or maximum hours of ventilation needed for inclusion. The exclusion criteria include age <18 years, use of non-invasive ventilation not followed by invasive ventilation, patients whose invasive mechanical ventilation started before the 28-day period of inclusion, and patients transferred from another hospital under invasive ventilation. Patients will be stratified in three groups for comparison of the primary and secondary endpoints: patients without ARDS, patients without but at risk for development of ARDS, according to the Lung Injury Prediction Score (LIPS, table 1)23 and patients with ARDS, according to the Berlin definition.24 Patients with ARDS will also be stratified according to severity of ARDS, based on the oxygenation (mild, moderate and severe ARDS categories). Local investigators will screen all patients who start invasive ventilation in one of the participating ICUs during a predefined period of 28 days, lasting from 08:00 hours on the Monday of the first week to 07:59 hours on the Monday 4 weeks later. The exact starting date will be flexible for participating centres and shall be determined by the national study coordinator. Data collection has started in November 2017 in some sites; all sites are expected to initiate the service evaluation within 1 year after the overall start. Baseline and demographic variables will be collected on the day of admission, including gender, age, actual or estimated weight and height, smoking status, comorbidities including chronic obstructive pulmonary disease, active cancer, heart failure, diabetes mellitus, chronic kidney failure, liver cirrhosis and arterial hypertension, the presence of ARDS according to the Berlin definition, the LIPS, reason for ICU admission. On the day of start of invasive ventilation, we will document the reason for starting mechanical ventilation and whether the patient received non-invasive ventilation before intubation. Every day, until day 3 from admission in the ICU, until ICU discharge or death, whichever comes first, the ventilation status and ventilation characteristics will be collected, including ventilation mode, VT size, respiratory rate (set and measured), peak and plateau pressure, PEEP, inspired oxygen fraction, peripheral oxygen saturation, blood gas analysis data when available (arterial oxygen tension, arterial carbon dioxide tension, arterial bicarbonate, arterial pH), end-tidal CO2, when available and haemodynamic parameters like heart rate and systolic blood pressure. Every day, until day 7, ICU discharge or death, whichever comes first, the occurrence of pulmonary complications will be scored, including new requirement of invasive ventilation after initial extubation, pulmonary infections, atelectasis, pneumothorax, pleural effusions, new pulmonary infiltrates and development or worsening of ARDS. On the day of ICU discharge (maximum 60 days after recruitment), outcome will be recorded as follows: death, discharge to ward, to medium care or high dependency unit, discharge to home for palliative care, or transfer to another ICU. The date of extubation, reintubation and tracheostomy (if performed) will also be recorded in this moment. The primary endpoint is VT size in millilitres per kilogram of predicted body weight (mL/kg PBW) and PEEP in centimetres of water (cm H2O) used among diverse ICU patient categories during the first 3 days of mechanical ventilation. 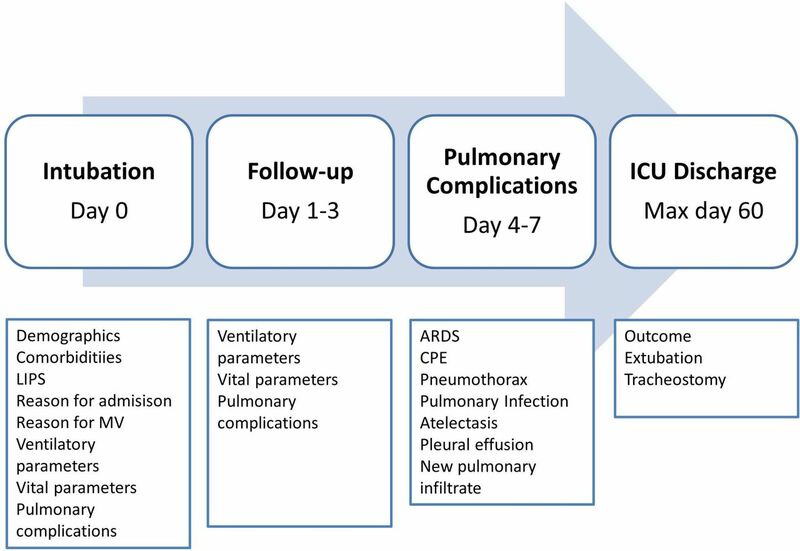 Secondary clinical endpoints include other ventilation parameters (including respiratory system driving pressure, the proportion of patients at risk of ARDS as stratified by the LIPS or ARDS defined by the Berlin definition, the occurrence of pulmonary complications, length of stay in ICU, duration of invasive ventilation and all-cause ICU mortality. All-cause ICU mortality is defined as any death in the ICU. ICU length of stay is defined as the time between ICU admission and ICU discharge or death in ICU. The number of days of ventilation is defined as time between endotracheal intubation and successful extubation (in case of intermittent mechanical ventilation via a tracheostomy, every day a patient needs ventilation counts as one extra day, irrespective of the duration of ventilation on that specific day). In case of non-invasive ventilation, the duration will be assessed separated from the assessment of invasive ventilation. The presence of spontaneous activity will be identified by any recorded difference between the set and measured respiratory rate. Driving pressure will be calculated by subtracting the level of PEEP from the plateau pressure (Pplat in volume-control ventilation) or maximal airway pressure (Pmax in pressure-control ventilation). Pplat and Pmax are considered reliable for this calculation if the patient is receiving complete ventilatory assistance without evidence of spontaneous activity, that is, only when the set respiratory rate equals the measured respiratory rate. Peak airways pressures will not be used to compute driving pressure as these represent a poor surrogate of the plateau pressure. Only pulmonary complications that occur after the first 24 hours of invasive ventilation will be considered in analysis, as events preceding this time point may very well be considered the potential reason for intubation. A pulmonary infection requires the presence of new or changed lung opacities on chest radiography and/or new or changed sputum plus at least a temperature >38.3°C or a white cell count >12 x10^9/L of blood. Atelectasis require the presence of increased density (lung opacity) on one or more chest radiographs with displacement of the fissures towards the area of atelectasis, crowding of pulmonary vessels and bronchi in the atelectatic region, upward displacement of hemidiaphragm ipsilateral to the side of atelectasis, that may be accompanied by shift of the mediastinum or hilum towards the affected area and compensatory overinflation in the unaffected lung.25 Pleural effusion is suggested by lung opacification with shift of the mediastinum, hilum or hemidiaphragm towards the non-affected area. Pneumothorax requires the presence of air in the pleural space with no vascular bed surrounding the visceral pleura. ARDS is defined according to the Berlin definition24 with alternative oxygenation criteria based on pulse oximetry oxygen saturation/fractional inspired oxygen applicable only when blood gas analysis data is unavailable (table 2A,B).26 27 Worsening of ARDS is defined as any change in the prior classification (ie, from mild to moderate or severe ARDS, or from moderate to severe ARDS). Data will be collected from a paper medical chart, or an electronic patient data management system if available. Local investigators transcribe the collected data directly onto an anonymised internet-based electronic case report form (CRF) (Research Electronic Data Capture,28 www.projectredcap.org). In some centres, data may be recorded on paper CRF and successively transcribed on the electronic CRF at a later time point. Access to the data-entry system is protected by a personalised username and password. The data will be kept on a central secured server located at the Hospital Israelita Albert Einstein, Sao Paulo, Brazil. The structure of the electronic CRF is detailed in figure 2. A screening log with limited patient data will be completed with all the included and excluded patients during the enrolment window. Participating centres are instructed to enter data for the daily follow-up using values obtained as close as possible to 08:00 hours, but only when the patient is stable at that time point. The study day for the recording of pulmonary complications will be defined as the natural 24 hours period from 00:00 to 23:59 hours, to ensure that data are captured only once. Data for ICU discharge will be collected until a maximum of 60 days after ICU admission, after which the CRF for that patient will be closed. Sequence of data submission in the electronic case report form. ARDS, acute respiratory distress syndrome; CPE, cardiogenic pulmonary oedema; ICU, intensive care unit; LIPS, Lung Injury Prediction Score; MV, mechanical ventilation. PRoVENT-iMIC will be conducted in 11 Asian countries, with a varying number of ICUs per country. Participating ICUs are selected on the basis of willingness to participate. There are no a priori established requirements for participation, and private as well as public centres are eligible to represent real-life practices. A one-time web-based prestudy survey on structure, organisational aspects and delivery of care in the participating centres will be performed. Each participating centre is surveyed once regarding the following information: hospital characteristics (private vs public), ICU characteristics (medical vs surgical vs mixed and open vs closed, number of ICU beds, annual number of patient admitted, number of ventilators available, and other organ support measures) and staffing (nurse-to-patient ratio, physician-to-patient ratio, presence of specialised medical staff and overnight coverage). No formal sample size calculation was performed, but we expect each centre to enrol 20–40 patients in the allocated time period, yielding a total of 1200–2400 patients. We consider this figure sufficient to analyse the study endpoints. Normally distributed variables will be expressed by their mean and SD; not normally distributed variables will be expressed by their medians and IQR; categorical variables will be expressed as n (%). In test groups of continuous normally distributed variables, Student’s t-test will be used. Likewise if continuous data are not normally distributed, the Mann-Whitney U test will be used. Categorical variables will be compared with the χ2 test or Fisher’s exact test or when appropriate as relative risks. Statistical uncertainty will be expressed by 95% CIs. The primary outcome (VT size (mL/kg PBW) and PEEP (cm H2O) levels during the first 3 days of mechanical ventilation) will be analysed and compared between patients at no risk for ARDS, patients at risk for ARDS and in patients with ARDS (in case the diagnosis of ARDS could be made on admission). If the data are normally distributed, one-way analysis of variance (ANOVA) or two-way ANOVA assessing the time interaction between groups and days of observation will be used. When not normally distributed the Kruskal-Wallis test or Friedman test assessing the time interaction between groups and days of observation will be used. Univariate analysis will be performed to identify potential factors associated with outcomes including, but not limited to, ventilator settings (in particular VT and PEEP). A multivariate logistic regression model will be used to determine which of those factors are independent. A stepwise approach will be used to enter new terms into the model, with a limit of p<0.2 to enter the terms. Time to event variables is analysed using Cox regression and visualised by Kaplan-Meier. Time-course variables (eg, repeated measures of ventilator parameters, vital signs, oxygenation parameters and others) are also analysed by linear mixed model. The linear mixed-models procedure expands the generalised linear model so that the data are permitted to exhibit correlated and non-constant variability. 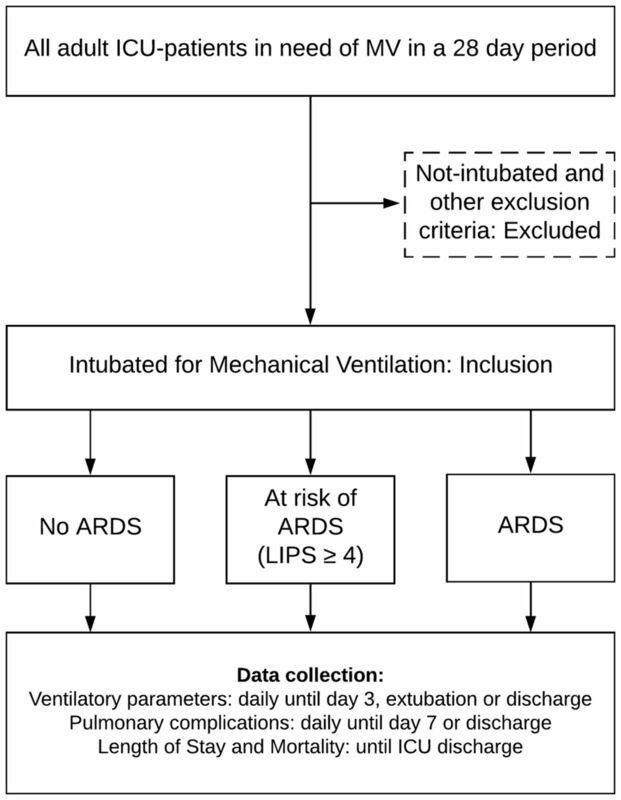 Prespecified subgroups in the analyses studying potential associations between ventilator settings and outcome will be: (1) patients at low risk of ARDS versus patients at risk of ARDS; (2) patients without ARDS versus patients with ARDS; (3) reason for ICU admission and (4) reason for start of invasive ventilation. Statistical analyses will be conducted using R (www.r-project.org). A p value of less than 0.05 will be considered statistically significant. The Steering Committee is composed of a selection of PROVE Network investigators plus the national coordinators from each participating country. These investigators were involved in the design of PRoVENT-iMIC. National coordinators are responsible for identifying and recruiting local participating centres. They assist and train the local investigators and oversee the conduct of the study, including administrative management, record keeping and data management. Local investigators in individual participating centres will provide scientific and structural leadership, ensuring local ethical and regulatory approvals are obtained before start of patient inclusion. National coordinators and local investigators are expected to guarantee the quality and security of the data collected. Prior to start of the study, study teams in each centre will undergo a web-based training session on how to capture data in the electronic CRF. All study team members will be provided with a manual of operations with instructions on how to accurately fill the forms and the screening log. Incomplete or incorrectly entered electronic CRFs will be signalled to the local investigators by the national and international coordinator, for further review of the missing or flagged data. Patients and public were not directly involved in any phase of this study. Data management, monitoring and reporting of the study will be performed in accordance with the International Conference on Harmonisation—Good Clinical Practice guidelines. All participating centres will also submit the study protocol to the national or local institutional review board for ethical judgement, as applicable by the current regulations in the country. Due to the strict observational design and anonymous collection of data, informed consent may not be required in most countries. However, where informed consent is required, this must be approved by the local ethical committee before the start of inclusion. The study will be reported following the Strengthening the reporting of Observational Studies in Epidemiology statement guidelines and checklists.29 The results of this study will be published in a peer-reviewed medical journal. After publication of the primary results, on request the pooled dataset will be available for all members of the PRoVENT-iMIC collaboration for secondary analysis, after judgement and approval of scientific quality and validity of the proposed analysis by the Steering Committee. PRoVENT-iMIC is designed to characterise the epidemiology, ventilator management, occurrence of pulmonary complications and outcomes in invasively ventilated patients in an estimated 60 ICUs in 11 Asian countries. The results of PRoVENT-iMIC will help to understand current ventilation practice in South and Southeast Asia, particularly with respect to variability in ventilator settings among patients without, at risk for or with established ARDS. Results of this study will be used to plan future trials of ventilation in ICU patients in these settings. PRoVENT-iMIC has several strengths. First, its prospective design will allow a higher accuracy of data capturing with regard to exposures, confounders and endpoints compared with studies that used a retrospective design.30 While a prospective design may cause sources of bias and fail to establish causal effects, it minimises the chance of residual confounding by unmeasured variables, a common limitation with a retrospective design, as has frequently been used in mechanical ventilation epidemiological studies.31–33 We will have a sample size large enough to obtain precise estimates of pulmonary complications and ICU mortality and to examine potential associations between ventilation practice and patient outcomes. Second, the study sample is not restricted to certain patient diagnostic categories. Third, the attention on ventilation practice will provide robust data on this specific domain while the 7 days follow-up will allow precise recording of pulmonary complications at their origin. And finally, the wide representation of Asian countries will allow inferences on geoeconomic differences in epidemiology, management and outcomes of mechanical ventilation across the entire subcontinent. The focus on South and Southeast Asia follows our scarce knowledge about clinical practices and ventilation strategies used in critically ill patients in this and other resource-limited settings.21 The burden of critical illness in low-income and middle-income countries is higher than generally perceived and it is expected to increase with an ageing population.34 Additionally, ICUs are increasingly being set up in the region, especially in busy urban settings. A recent survey highlighted considerable variation in structure, organisation and critical care delivery in Asian ICUs, but did not shed light on ventilation management and patient-centred ventilation-associated outcomes.35 This information, however, is crucial for future trials of ventilation in ICU patients in these settings, as we need to know whether critically ill patients across Asia equally benefit from lung-protective ventilation as those in Western countries. Additionally, for proper power calculations, information with regard to potential primary endpoints, like the incidence of development of ARDS, duration of ventilation or death, is highly needed. PRoVENT-iMIC will be the first observational study that can provide this information for settings in South Asia. Results restricted to individual settings could also be valuable for local clinicians seeking to improve their local practice, training planning and identify local priorities for quality improvement within their departments. There is now strong evidence-based support for various ICU process-based interventions such as lung-protective ventilation,36 conservative fluid management strategies37 and weaning protocols.38 While centre-specific or country-specific practices or restrictions of resources are potential challenges that affect implementation of all these interventions, we focus on the management of ventilation and especially on the employment of lung-protective ventilation where feasibility may represent an issue-specific to resource-limited settings. Recent literature has underlined the potential role of the driving pressure (the pressure amplitude during each artificial breath) and its determinants in the development of ventilator-associated lung injury. Results from PRoVENT-iMIC will provide further data to enable us to discriminate the effects of VT size, PEEP and driving pressure on outcomes in patients with, at risk of, or without ARDS. PRoVENT-iMIC will provide important data regarding outcomes following invasive ventilation, including a wide range of clinically important pulmonary complications. Historical studies from low-resource settings documented mortality rates to exceed 70%.14–16 However, more recent data from South America and India have documented mortality rates of ~40%, similar to that in high-income countries.17 18 This suggests that mortality in ventilated patients has the potential to improve in low-resource settings.12 13 39 Although many factors may influence mortality, several underappreciated factors related to invasive ventilation may have contributed, including reduced need for invasive ventilation per se, improvements in safety of invasive ventilation and in liberation from invasive ventilation. Our interest in patients at risk of ARDS follows a global recent shift in ARDS research. It is now clear that ARDS is rarely present at the time of the initial healthcare encounter, and typically develops during the hospital course, usually between days 2 and 5 in patients with predisposing conditions or risk factors.40 Hence, increasing efforts are being directed towards early identification of patients at risk with a goal of prevention and early treatment prior to the development of a fully established syndrome. This is probably equally important in resource-limited settings where the predisposing conditions and risk modifiers for ARDS may differ and limited escalation of therapy is often the case. PRoVENT-iMIC will be the first study to evaluate prospectively the role of LIPS in these settings. Although the poor predictive accuracy of the LIPS does not currently support its use in everyday clinical practice,41 it has enabled enrolment in clinical trials of ARDS prevention23 and may yield an initial idea on the patients at risk of and disease progression in the Asian settings under study. PRoVENT-iMIC has some noticeable shortcomings. The definition of ‘middle-income’ country is rather artificial as the level of health expenditure, local resources and other geocultural factors might affect the processes of care in a larger extent than national income classification. Despite the inclusion of ICUs from 11 countries, which improves study generalisability, caution is needed when applying the results to supposedly similar settings, as substantial intranational and transnational variations in ICU resources, staffing and organisation exist. Second, the CRF used in PRoVENT-iMIC was designed so that it would not induce excessive workload for the participating centres. Therefore, we decided not to collect data regarding extrapulmonary complications and hospital discharge outcomes, neither the amounts of sedation used and sedation levels. Similarly, due to the time window restricted to the ICU stay, we will apply the LIPS at ICU admission and not in the first 6 hours after hospital admission, as originally designed. Mortality may be underestimated in some settings where due to local practices there is the possibility to be discharged home in case of terminal conditions or family decision. To address this we made sure the data collection form captures this event whenever it represents the reason of discharge. Third, due to the limitation of laboratory data, we will have a limited dataset that will not comprise daily severity scores useful for statistical controlling purposes. Also, the conceivable limitation in blood gas analysis and radiology examinations may limit the documentation of insurgence or worsening of ARDS and other pulmonary complications. Fourth, as in patients on pressure-control modes flow might not reach zero during inspiration, Pmax might overestimate alveolar pressure, hence overestimating driving pressure. An end-inspiratory occlusion could solve this problem, but is almost never performed in many centres. As this study only uses data that is collected as part of standard care, all analysis regarding driving pressure will be done separately for patients on pressure-control modes and volume-control modes. Finally, we cannot exclude that ventilator settings applied by treating physicians might be biased by the participation in the study, a problem that also existed in prior multinational studies.11 12 Also participation in international studies like PRoVENT-iMIC always bears the risk of biased to those centres that do not fully or reliably represent ICU care in general in the participating countries. PRoVENT-iMIC is designed to understand the epidemiology, practice of ventilation and outcomes of critically ill patients receiving invasive ventilation in a large set of South Asian countries. Results of this study could help identify practices that may best explain differences in outcomes, and could be used in designing new trials of ventilation in these settings.
. Ventilator-induced lung injury. N Engl J Med 2014;370:980.
. Current concepts of protective ventilation during general anaesthesia. Swiss Med Wkly 2015;145:w14211.
. Outcome of mechanical ventilation in Central Africa. Ann R Coll Surg Engl 1988;70:76–9.
. Outcome of mechanical ventilation in Sri Lanka. Ann R Coll Surg Engl 1989;71:344–6. The World Bank. World bank country classification. https://datahelpdesk.worldbank.org/knowledgebase/topics/19280-country-classification (accessed 17 Dec 2017).
. The ARDS Definition Task Force. Acute respiratory distress syndrome: the Berlin Definition. JAMA J Am Med Assoc 2012;307:1. Contributors LP, AGA, ASN, AMD and MJS were equally responsible for writing of the manuscript and participated in study design. FP and PP participated in study design and assisted in writing of the manuscript. AA, AB, KC, AF, RaH, ReH, MH, HAI, KI, SI, GK, BK, HM, BN, RP, SS, LT, SG, NNT, NMY and MGdA reviewed the manuscript and agreed with submission. Funding This research received no specific grant from any funding agency in the public, commercial or not–for profit sectors. Ethics approval The Oxford Tropical Research Ethical Committee at the University of Oxford, UK, exempted the study from ethical review on the 9 June 2017. Collaborators MORU, the Mahidol Oxford Tropical Medicine Research Unit, Bangkok, Thailand (www.tropmedres.ac). PROVE Network, the Protective Ventilation Network (www.provenet.eu).